Celebrate The 2018 Holidays at the Universal Orlando Resort™! Universal Orlando™ unwraps a resort-wide celebration that will elevate your holiday season. All your beloved favorites are here. You can experience Christmas in The Wizarding World as Hogsmeade™ and Diagon Alley™ are transformed by festive decorations and special entertainment. You can watch the live retelling of Dr. Seuss’s classic holiday tale starring The Grinch™ as the Grinchmas Who-liday Spectacular returns. Merry and Mayhem combine as the Minions join Santa Claus in Universal’s Holiday Parade featuring Macy’s along with characters from Madagascar and Shrek. You can celebrate the season like never before at Universal Orlando Resort. You’ve Never Had a Holiday Like This. Both The Wizarding World of Harry Potter™ – Hogsmeade™ and The Wizarding World of Harry Potter™ – Diagon Alley™ will be transformed by festive decorations, treats and special entertainment. And as the stars begin to shine, a stunning projection, The Magic of Christmas at Hogwarts™, wraps the castle in spectacular holiday spirit. Merry and Mayhem combine as the Minions join Santa Claus in this all-new incarnation of a holiday favorite that also features characters from Madagascar and Shrek. Seuss Landing™ is home to the Grinchmas Who-liday Spectacular, a live retelling of Dr. Seuss’s classic holiday tale starring The Grinch™. And this is the perfect time of the year to start your day by enjoying breakfast with The Grinch™ & Friends! The best-selling holiday artist returns for live performances on select nights. To round out the fun, you can be a part of EVE, Universal CityWalk’s eye-popping, mind-blowing, jam-packed New Year’s celebration! The best way for you to experience the Holidays at Universal Orlando Resort™ is with a Splash Stay and Play Vacation Package, which includes 5-Night hotel accommodations at a Universal Partner Hotel along with a 3-Park 5-Day Base Ticket^ to Universal Studios Florida™, Universal’s Islands of Adventure AND Universal’s Volcano Bay™. Guests will also have Early Park Admission◊ to The Wizarding World of Harry Potter™ and Universal’s Volcano Bay™ one hour before the park opens (valid theme park admission required). Starting at $99** per adult, per night, tax inclusive. Events occur rain or shine. No rain checks, refunds, or returns. Prices, dates, times, attractions, and entertainment subject to availability and may change without notice. Additional restrictions may apply. *Must be 21 or older to purchase an EVE ticket. Must be 21 to consume beverage alcohol. Must have valid identification. Tickets do not include entrance to the theme parks. Tickets do not include non-alcoholic or alcoholic beverages. Macy’s Thanksgiving Day Parade & Related Characters ©2018 Macy’s Inc. All rights reserved. Universal elements and all related indicia TM & © 2018 Universal Studios. All rights reserved. Shrek © 2018 DreamWorks Animation LLC. All Rights Reserved. Madagascar © 2018 DreamWorks Animation LLC. All Rights Reserved. Dr. Seuss properties TM & © 2018 Dr. Seuss Enterprises, L.P. All rights reserved. Mannheim Steamroller is a registered trademark of Chip Davis. ^The 3-Park 5-Day Base Ticket entitles one (1) guest admission to ONE (1) Universal Orlando Resort™ theme park per day: Universal Studios Florida™ OR Universal’s Islands of Adventure™ OR Universal’s Volcano Bay™ Water Theme Park. Ticket is valid for any five (5) calendar days during a seven (7) consecutive calendar day period which includes the first day any portion of the ticket is used. This ticket also includes seven (7) consecutive calendar days of admission to select live entertainment venues of Universal CityWalk™ which commences and includes the first day any portion of the ticket is used. The ticket will expire in full on the expiration date printed on ticket. Unused days shall be forfeited. Ticket excludes admission to separately ticketed events at either of the Universal theme parks or within any of the CityWalk venues. Some CityWalk venues require ages 21 or older for admission . Valid photo ID required. Does not include admission to AMC® Universal Cineplex 20 with IMAX®, the Blue Man Group show, or Hollywood Drive-In Golf™. Subject to availability. Unless otherwise stated, parking is not included and there are no discounts on food or merchandise. Additional restrictions may apply and benefits are subject to change without notice. ◊Requires theme park admission. Early Park Admission begins one (1) hour prior to regular scheduled park opening to either Universal Studios Florida™ or Universal’s Islands of Adventure™ as determined by Universal Orlando and Universal’s Volcano Bay™. Valid at select attractions at each park. Attractions are subject to substitutions without notice. Additional restrictions may apply. **Rate is per adult, per night, tax inclusive and based on double adult occupancy for a 5-night stay at the Rosen Inn International, Standard Room. Subject to availability, room type, hotel, and travel dates selected. Rate valid for bookings now – 6/30/18 and travel Sunday – Thursday; 1/2/18-10/4/18, 10/7/18-10/11/18, 10/14/18-10/18/18, 10/21/18-10/25/18, 10/28/18-12/20/18. 4 Night Minimum Required. Reservation must be made 72 hours in advance. Additional hotels, rates and travel dates available. To Plan & Book Your Exciting Holiday Vacation to Universal Orlando Today! Click HERE to request additional information regarding Destinations, Planning and booking a Walt Disney World Resort Vacation Package. 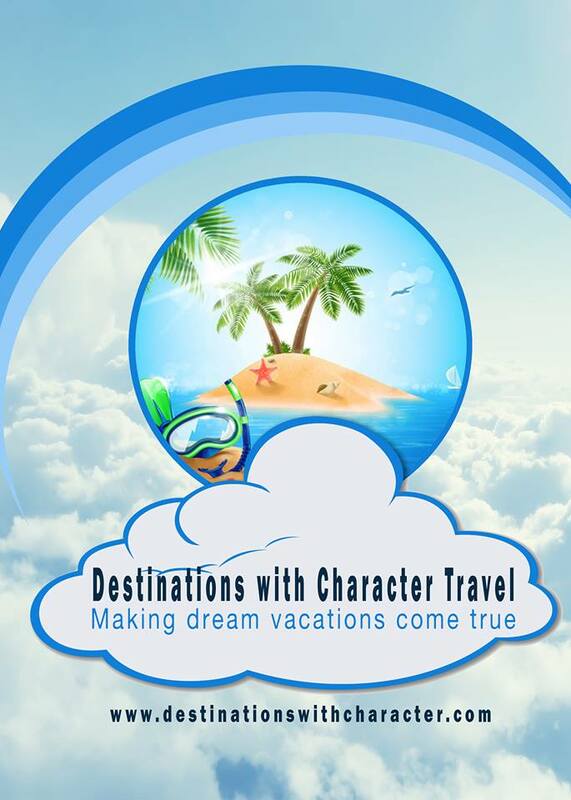 Experience for yourself the Stress Free and Hassle Free process available with Destinations with Character Travel. FREE Advanced Dining Reservation Services, Trained Dedicated Agents, and So Much More! New Carnival Panorama Now Available For 2019 West Coast Bookings! “Return To Sleepy Hollow” at Disney’s Fort Wilderness Resort & Campground Begins September 28 & Don’t Forget Mickey’s Not So Scary Halloween Party (MNSSHP) Tickets Are Now On Sale!